Still my largest holding and a great opportunity. Once again, I added more to my position today in Community Bancorp (CMTV) at $16.10. The stock has fluctuated a lot most likely due to overall market pressures and due to trading over the counter. However, the company is very stable, growing and is located in a market that has good loan growth potential. Like Merchant’s Bank, it’s a smaller local bank that doesn’t engage in risky financial business. 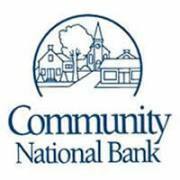 Since Community Bancorp is local and it’s market is more local/small business, it should be less impacted by national issues such as the trade war with China. Dividend yield is 4.72% (based on most recent dividend payouts of .19). One of the better dividend yields for the low risk nature of this business. It’s got a low book value and PEG, not as low as Capital One (another recent holding), but with a less risk in my opinion and the dividend is a big good selling point. However, if it should have a significant increase from this point I will probably sell some if other opportunities arise as I have a larger percentage of my portfolio in this single company than I’m usually comfortable with. However, I’m fairly comfortable parking a significant portion of my capital here while waiting for other opportunities to diversify. See more comments on Community Bancorp here. As some of you know we purchased the Wondermugs business recently after years of successfully selling them on our other retail websites champlaincoffee.com and niftycoolgifts.com. We have spent the last year rebuilding the business from the ground up and we starting to see real progress! A big thank you to all those that helped so far, especially my wife Heavenly Ryan for all her support, marketing and customer service work and my brother Richard Bird with tweaking the designs! They are looking really good! I initiated a new position last week in Amazon.com, Inc. (AMZN) at $1,657.24. It is our 8th largest position at this time. Inability to make significant profits from the amazon.com retail business. Political/social pressure from their growing size and influence on the retail industry. Amazon Web Services competition from well capitalized competitors: Microsoft (MSFT) and Google (GOOG). Amazon has been on my watch list for a while as I currently sell various products on Amazon and use their advertising system to advertise products. I shop there, but not nearly as much as I used to. For the last year or so, I moved more of my shopping to Walmart (WMT) due to lower prices mainly. I usually buy from Amazon if I cannot find the product at Walmart.com. Although it seems that many that shop at Amazon don’t necessary care about the lowest price and it has been shown to be a favorite among Generation Z and Millennials. While Amazon has been reluctant to monetize Amazon.com due to aggressive plans to acquire market share, they have been able to grow and monetize Amazon Web Services, which produces the majority of their profits. What I’m most excited about is their ability to collect ad revenue from vendors that promote their products on Amazon.com. This is how Facebook and Google make most of their revenue and by relying more upon 3rd party sellers, Amazon doesn’t need to worry about cost of goods. They make money no matter what, more like Ebay’s (EBAY) business model. It seems that over time many consumers are skipping searching on Google and going right to Amazon.com first to do product research and on the flip side, many brands are putting more effort on selling on Amazon over selling directly on their own websites. Some will create a website just to direct customers to make the purchase on Amazon.com. It’s seems that over time, more brands could push more of the sales to a few marketplaces such as Amazon.com, Walmart.com and Ebay.com along with some niche players such as Etsy.com making less of need for many of the other retailers currently out there. While I don’t believe Amazon will end up with all retail, I do think that over time, we will end up with a lot less retailers and few large marketplaces where most online sales and maybe bricks and mortar business is done. The struggles of Bon Ton, Sears, Kmart, Circuit City, Toys ‘R’ Us to name a few show this is the case. The forward PE and Price/Book are higher than I like and I usually prefer companies that pay a dividend. However, they have a huge earning potential and I think that this will grow significantly at some point. They could keep their margins on retail low, but make significant amounts from ad revenue like Facebook and Google do. The current PEG of 1 is very attractive to me and is why I see the stock is a bargain at this time. I believe the current stock price drop represents a great opportunity for those not currently invested or with a small position in AMZN. If the price should continue to drop, I will most likely add to this initial position. On 4/11/2014, Jacob G. Hornberger and Sheldon Richman of The Future of Freedom Foundation held a talk at UVM hosted by the UVM chapter of Young Americans for Liberty. It was a very good talk focused getting government out of our daily lives and out of foreign affairs. It seemed that the biggest area of discussion and perhaps disagreement with the audience was over US involvement overseas. It seems that it’s seen that it may be our duty to police the world in order to keep our allies and ultimately ourselves safe, as opposed to focusing on defense. J : Instead of trying to reform health care, social security we should just repeal them… government should also get out of education. S : We need a theory of social change. We need a huge change in the way people think. Friedman taught many about the free market. J : Freidman wasted time. I advocated against school vouchers. Vouchers entrenches the government in education. We need a total separation of education and state. We need to shoot for the goal. S : Incremental steps are good such as 50% tax reduction. Opposed school vouchers as it’s not a step in the right direction. J : Conservatives are for reform, Libertarians are for complete freedom. S: Saying you want to abolish doesn’t do anything. People need to be open to ideas. J : Problem is people believe they are free. Libertarians say they want freedom and people don’t understand what you mean. S : In good measure people are free compared to Cuba. We can buy books and move around freely. Not wacked out, as we can live fairly free. It’s just not enough. J : If you can vote and do what you want Saturday morning you feel free. Why can you not work the job you want such as a doctor, lawyer or keep all your income or do the drugs you want without permission from government. S : To many ancients freedom meant being able to participate in government through voting. Modern freedom is the right to do as you want with yourself and property. As a society we are heading back to the ancient meaning of freedom. J : We’re born into system that says your free when you’re really not. It’s a surprise to people when they discover libertarianism and learn just how unfree we are. Also many laws such as minimum wage actually hurt the poor. S : Many people don’t understand economics. Don’t realize that economics should by self-running. It should run itself. We need to educate people. Many of us libertarians read something that clicks but many don’t. J : Safety nets sound comforting but free markets are the ultimate safety net for people. National security issues keep people fearful and believing they need them and they provoke problems. S : If you are ignorant of the history of US intervention overseas you don’t understand why we’re being attacked. We need to educate people that the best way to defend ourselves is to stop provoking people. J : We need to stop causing problems in the middle east going back to Iran with US overthrowing the government and placing the Shah of Iran in power who was unpopular. S : Lack of information. People believe big military is better than the alternative of chaos. J : The real way to maintain freedom is to dismantle big military and the welfare state. Members of audience very concerned about nuclear weapons, unstable countries, humanitarian aid, problems like Somalia. Believe the US government needs to be involved to remove weapons and help allies of the US government. S : Sceptical that government makes it better such as Libya with huge flow of arms. People here don’t know enough about societies and end up making matters worse such as in Iraq. The people making policies don’t know what they are doing based on history. Often the people we support are just as bad as the people we fight. Any modern problem is caused by past actions of outside entities such as creating borders that don’t make sense, splitting tribes and grouping people that don’t get along that fight for control of the government. J : Rational for other countries to develop nuclear weapons because the US is a threat to their freedom. John Quincy Adams in “In Search of Monsters to Destroy?” stated we will not help you outside the US but you are free to come here no questions asked with open immigration. Private people can go over and do what they want to help. S : History in US is clear that we’ve always had empire on the mind under the guise of national security. J : Look at what it has done to us. We lead the world in torture and assassination. We would never have approved of this previously but now we look the other way. S : Libertarians don’t promise a utopia, but won’t make matters worse. J : As young people you live nice lives now and many register for draft to get educational funds and the us government would have no problem sending you to your death for nothing. Another person said that libertarians telling people that they don’t promise safety scares people and they like being told by government that they will do whatever they need to do to make it them safe. People like the large military and support the troops. J : Fear is important to the government. How do we overcome the fear citizens have and willing to trade freedom for safety. Don’t know how we change that. Recommended Reading: Hazlet, Mises, Hayek, Bastiat wrote great stuff on economics. Visit http://www.FFF.org for more information on The Future of Freedom Foundation. 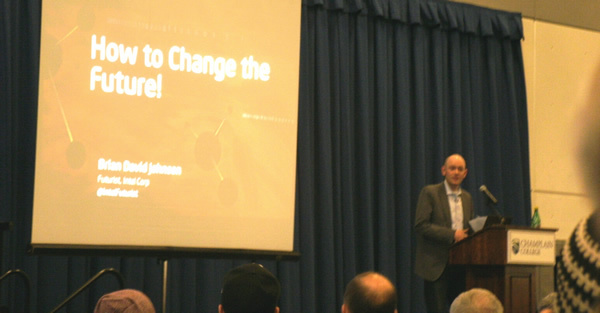 Below is another video Jacob G. Hornberger and Sheldon Richman did after the talk discussing their trip throughout the northeast and some highlights of the discussions. A survey as been put out by the @NorthEndNPA asking what residents want for their community. Anyone is welcome to comment on this. I just submitted my comments, which are below. I had trouble with the form, but you can also email them to [email protected] like a did. What is your first impression of the above introduction? Before getting into specifics I would like an untainted thought or two. Either New North End (NNE) or North Burlington if fine. However, people are used to the area being called the “New North End” so I’m not sure there is a real compelling reason to change it. However, I have often wondered about the possibility of the NNE splitting off from Burlington to become its own town and North Burlington could be a good name for it. 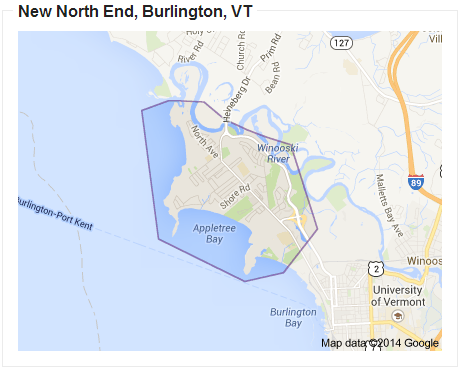 Basically, we could do what South Burlington did when they split off from Burlington or Winooski from Colchester. They sought charter changes from the state legislature to become their own towns and were given that status. It seems there would be a growing interest as it seems many citizens are not pleased with the treatment of the city government towards the NNE. Perhaps now would be the time to explore this option further? 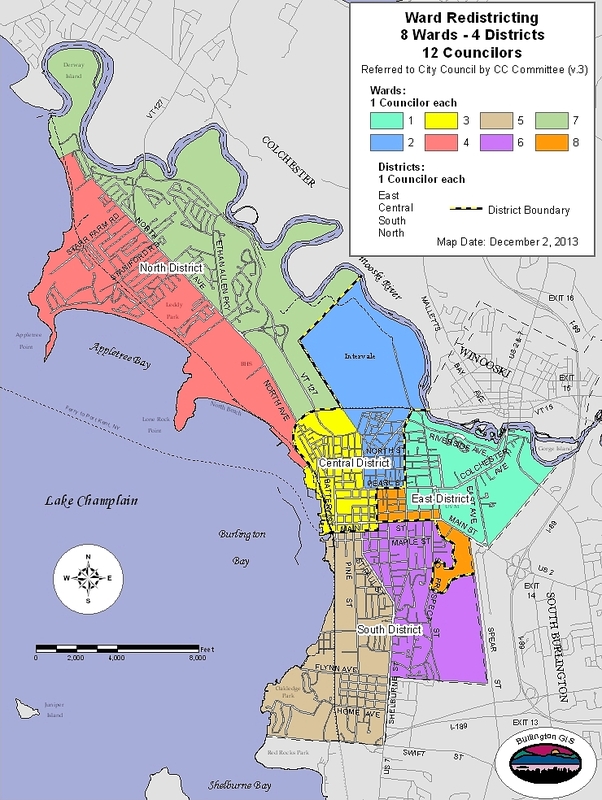 What are the best aspects of North Burlington now? Before we duplicate or forget our better features. Love the Leddy park and beach, and the bike path. We use them a lot during the summer months. What are we missing? Many ideas have been mentioned, now it is your turn. More affordable shopping options such as a department store and lower cost dining and entertainment. What ideas below are important to you? Each of us has our own wish list. Check the ones below. A business association for the NNE is an interesting idea. It could be like BBA.org but specifically for the NNE. I’m a member of BBA so I’m familiar with how they operate. They have a good level of engagement, but are increasingly expensive for small businesses as time goes on, which can hinder micro business from getting involved. If a business organization with minimal fees could be created, it could provide a great lower cost option for them to be able to network. As a web developer, I would be able to provide website/hosting for the project and possibly be involved in the organization of it if there is desire from other area business people to start one. Does Increasing the Minimum Wage Work? Post by Burlington Free Press. Increasing the minimum wage shouldn’t make much of a difference as the starting wage, whatever it is, is always going to be at the bottom. When you increase the minimum wage the wages for everyone else will go up to compensate for the difference as the person that’s been working somewhere for a year isn’t going to want to make the same as the person who just started yesterday and so on. At least temporarily should give everyone a boost in buying power, especially those that earn the least as it would make the biggest difference to them. The labor unions like this policy because many of their contracts are tied to a certain amount/percentage over certain wages so it looks good for the unions when their memberships wages are going up. However, then the prices of goods and services must also go up to pay for the extra labor cost unless you import products outside of the country, bring in outside workers or replace human labor with machines, which of course reduces jobs. Also, it then excludes a group of workers that may be lacking in skills from competing for the easiest jobs since if you have to choose between two job candidates, one is slightly skilled more than the other but you have to pay them both the same wage, who are you going to go with? The skilled one. Now if the unskilled one could offer to accept a lower wage at first in order to be trained, you may go with that candidate. I was in this situation myself a few times. If this is not how it works, then why are they being so cheap… why not increase the minimum wage to $100/hour? 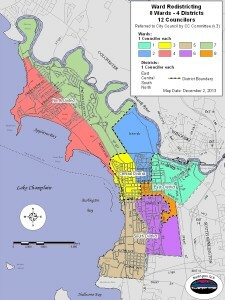 Ballot Item 5 – Proposed charter change RE: Ward Boundaries, City council, School board, Ward officer, and Voter registration board composition? The proposed redistricting plan would add an additional ward for a total of 8 wards with 4 larger districts. There would be 2 less city councilors for a a total of 12 city councilors. All city councilors would be voted on in 2015. I don’t like the idea of less representation on the city council. I would much rather the city just add more city councilor positions. Mayor Miro Weinberger has threatened to veto any addition of city councilors and current city council candidates have argued this fact as a reason to support the current proposal. However, they could simply override his veto if they wanted to. I imagine that the mayor and the current city council members don’t want any additional city councilors for one simple reason. I would dilute their power. The mayor only has one vote, any additional councilors will dilute his vote. Also, more new city councilors run the risk of new people not willing to support the established power’s plans. Plans going forward could be threatened. Having the 4 larger districts help solidify the incumbent’s ability to keep power as the larger the district the harder it would be a for a challenger to cover the district with signs and go door-to-door. I can certainly understand why the mayor and existing city councilors would want this proposal, but the voting citizens should see this as a threat to diverse representation on the city council. Jeremy Ryan, Roy Collette and Loyal Ploof sign waving for Ploof’s ward 4 city council campaign. 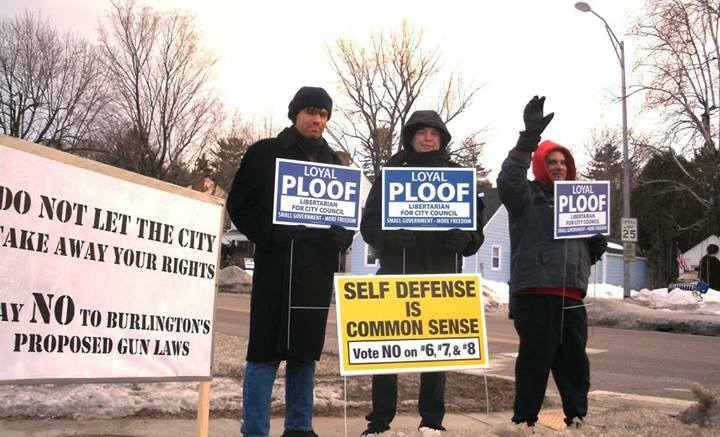 Ploof is a Libertarian and gun rights supporter. Ballot Items 6, 7 and 8 are about gun control and are probably the most controversial ballot items on the ballot. My guess is that like most things that city government tries to do this is just a step towards a complete gun ban in Burlington, which I’m sure some of the supporters of these 3 ballot items desire. Ballot Item 6 – Proposed charter change RE: Police confiscation/seizure of weapons during domestic abuse incident? At first glance, this may seem like a good policy. However, it’s fairly vague. What qualifies as a weapon specifically for starters and how do you determine for sure who’s weapons are who’s? Don’t you run the risk of seizing a weapon that the potential victim may need to defend themselves against the attacker? What specifically qualifies as a domestic abuse incident? We are not even specifically proposing to take weapons away from a convicted abuser, but just a suspected one, what qualifies as a suspected abuser? The current laws provide sufficient tools for police to deal with domestic abuse. If a citizen does harm to someone with ANY weapon, whether its a gun, bat, knife, or fist, they deserve to face consequences and the victim should be taken care of whether its special protection and/or compensation. However, this charter change seems to be unnecessary and could actually put potential victims at greater risk as a weapon may be the only defense someone may have against an abuser. Ballot Item 7 – Proposed charter change RE: Ban on firearms in any establishment with a liquor license? This one is an easy one to vote no against for me. Many bars, such as Manhattan Pizza, like the idea of not allowing firearms in their bars, so why can’t they just do it. A bar owner can set the rules as they see fit for patrons… why ask the government to do their own dirty work. I imagine many don’t want to come off as the “bad guy” and anger existing/potential customers. This charter change also would encompass a lot of properties in downtown Burlington as it means a ban of guns in all restaurants, bars, and many hotels. Again, I imagine this is only another step towards extending the ban to more areas to eventually cover the entire public area, just like what’s happening with smoking bans. The funny thing about criminals and abusers is they usually don’t follow the laws, so charter changes like this will not stop them from holding weapons, but will certainly make them feel more confident when committing crimes that their victims will be disarmed. Ballot Item 8 – Proposed charter change RE: Safe storage of firearms? Another really easy one to vote no on. This one would require firearms not in our immediate possession to be locked up. What sense does it make to keep a gun locked up if want to have it available during an emergency. My wife and I called for police help a few years ago and the response time was far too slow, over 2 hours I believe even though we are about 2 miles away from the nearest police department. If one feels comfortable depending on them or something else for protection so be it. However, if other citizens want to be able to defend themselves their own way who are we to stop them from protecting themselves as they want in their own home? Constitutionality of the Charter Changes? Even if all three pass by Burlington voters it may not matter since they would need state approval and it’s been argued that all three are unconstitutional. Other towns have tried passing gun control bans, just to be turned down by Montpelier. However, it’s possible that these might have a better chance as they are not as strict. Also, lets be honest here. Most of Burlington is quite peaceful. We have very little gun violence that I can think of. Is gun policy really something we need to be worried about? Don’t we have much bigger issues to worry about in Burlington? Perhaps its a distraction from the real issues. The last gun violence incident I know of in Burlington is when the Burlington Police gunned down a resident in our area who was armed with a shovel. Karen was a fiscally conservative, pro-liberty supporter of the law as created by the nation and state founders. While campaigning, Karen fought for victim’s rights, regulatory reform and gun rights. Karen felt there was too little justice for the victims of crime. Karen felt that we had too many laws and regulations that intruded on our liberty to use our own personal property as we see fit as well as costing the state much needed jobs. Karen also felt we must protect our state’s rights and as an example she spoke against the health care bill and wished to join other states in suing the federal government to overturn it. Karen also was a ardent supporter of the gun rights and spoke against actions to limit personal gun ownership. Karen was a very committed and passionate candidate for the Vermont Libertarian Party. She ran for office even in poor health traveling the state, attending state committee meetings, campaigning and fighting for victims and for what she felt was right, despite her personal suffering and poor finances. You can read more about Karen Kerin at her 2010 campaign website: http://www.karenkerin.com.